For questions or problems with the content, please contact Technical Support at 800-936-6899. Grounded in the best practices of effective writing instruction, Joining the Conversation’s rhetorical approach builds an awareness of writing purposes and genres as it teaches students to read critically, research effectively, and respond thoughtfully to the conversations around them. Comprehensive assignment chapters span reflective, informative, analytical and persuasive writing, following real students throughout their writing processes.Supportive apparatus guides writers from finding a conversation to join all the way through documenting their essays. Throughout the text, with techno-literate practice at the fore, multimodality is always an option and the conversation metaphor empowers students to make their voices heard—with their peers, in academic communities, and in the world. 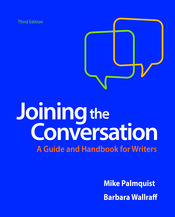 Based on reviewer feedback, the third edition of Joining the Conversation offers a new opening chapter on understanding yourself as a writer, more substantial academic readings on compelling subjects that matter to students, and an expanded digital option in Launchpad for Joining the Conversation. With theory put into practice, Joining the Conversation exemplifies the best of what writing instruction should be.